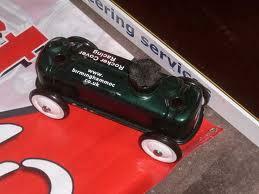 By popular demand, Mini Rocker Cover Racing will be at the IMM. With the track supplied by the Birmingham Mini Owners Club and the event sponsored by the Japan Mini Specialist Association (J.M.S.A), organisers of Japan Mini Day on 4 November 2014, it should be fun. 1. This is a fun event: Any person taking it too seriously will be ridiculed and shunned. 2. The judges’ decision is final although bribes are greatly received! 3. Teams are welcome to wear racing suits, fireproof overalls, helmets, goggles etc., but do so at their own risk of being laughed at. 4. Cars must be recognisably from a Mini engine and have four wheels. 5. Cars must not have any form of mechanical propulsion or steering, gravity being the only power source. Length – up to14 inches. Width – up to 8 inches. Height – up to 8 inches. Wheel diameter – up to 5 inches. Weight – up to 8 pounds. 7. Sponsorship logos, racing stickers and car names are encouraged but no obscenities please. 8. Wings for downforce, spoilers air dams and other appendages are all permitted so long as they fit in the nominated maximum dimensions of the car. They probably won’t do any good but we can all have a good giggle at them. 9. There will be heats of 2 racers per heat. 10.The racers will start with their front wheels on the start line. The first racer to have its front wheels cross the finish line is the winner. 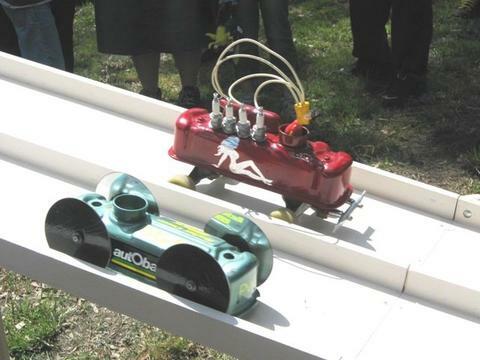 If neither racer makes it to the finish, the one going the furthest distance wins. 11.Any racer touching or crossing a lane marker shall be disqualified. The other racer becomes the winner. 12.Winning racers will advance to the next round until all are eliminated except one which becomes the outright winner. 14.Any protest must be lodged with the judge who will remind you of rule 1. 15.There are no more rules.